A couple of months ago I picked up a new full-suspension, geared mountain bike. Thankfully I'd paid for it first, otherwise this would be a completely different story. 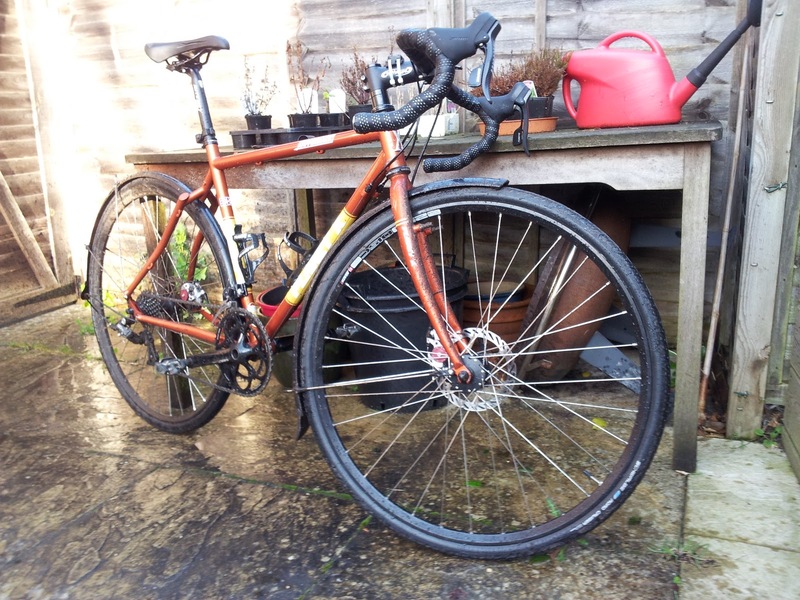 After the initial fiddling and tweaking I took it for its first proper off-road ride. "This bike is brilliant!" I said to myself, much to the consternation of a passing dog walker. It tracked through the singletrack like it knew where I wanted to go, the suspension soaked up the roots and rocks and the 2 x 10 drivetrain was faultless. Wow, a new favourite bike. I got home and hosed off the worst of the mud, squirted oil on the most important parts (grips and tyres, I find) and hung it up on the rack. Fast forward a week or two. Time for a road ride. The weather had been pretty crappy and the roads were scattered with puddles that could be considered minor lakes, grit, gravel, mud, leaves and various dead things. 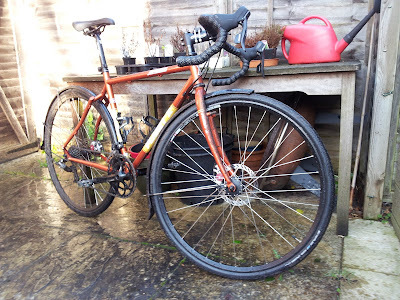 I grabbed my winter/cross/steamroller road bike - steel, heavy, full mudguards and disc brakes - and headed out. As I plowed through what passes for roads around here, bouncing over potholes, ignoring the muddy water splashing up and the cleanish water coming down, laughing at the God of punctures, I thought to myself "This bike is brilliant!". I was confident it could take the punishment, pleased it was so much faster than a mountain bike and most of all happy that it made me badass for riding in the rain. I got home and threw it in the garage. Meh, the chain was so thickly coated with oil that it'd take a Greenpeace clean-up team to make any difference. Another week. I'd not been out on my singlespeed for ages. It was still wet out so I dressed in full mud-proof armour. Waterproof 3/4s, softshell, winter boots. The bike, as well as being gear-free, was wearing Mud-X tyres (which, as a slight aside, are awesome) and a neoprene front mud-catcher. I slid and slithered around, balancing traction and grip, thankful I had no complex mechs to clog and grind. I thought to myself "This bike is perfect! Brilliant! I'd rather be on this bike than any other!". I got home and washed off just enough mud so that I could tell it was a bike, dribbled some lube on the chain and hung it up. All bikes can be ace, at the right time. For my 1.5 mile trip to work my cheap, knackered, never cleaned or serviced rat-bike is perfect. I'd rather not ride it up an Alp, but given the choice between that and walking I'd give it a damn good go - and I'd probably look back and grin at attempting it after the event. 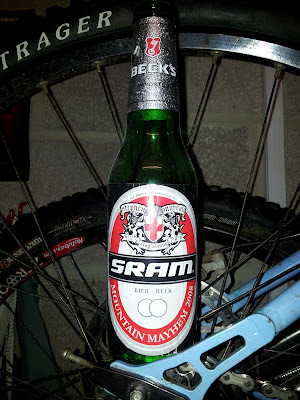 So maybe that needs rephrasing - all bikes are ace, at any time. The best bike, for any situation, at any point in time, is the one you're on.